Mumbai: Almost three years after the Limited Liability Partnership (LLP) Act, 2008, came into force, law firms are still in the dark over whether they can use the new corporate structure after the Bar Council of Delhi sent a warning that caused one law firm to close down its LLP entity. MCA’s LLP website states that “advocates" were “likely users" or “beneficiaries" of the LLP law, alongside chartered accountants (CAs) and cost and works accountants, and company secretaries. On 14 July, the Institute of Chartered Accountants of India decided to permit CAs to practise as LLPs. The primary effect of an LLP is that it limits each partner’s liability rather than all being on the hook for liability caused by another partner, explained Singhania and Partners LLP managing partner Ravi Singhania. LLPs also allow partnerships to grow beyond 20 partners although accounts have to made publicly available, unlike the fiercely guarded accounts in most traditional law firm partnerships. But in late October, the Delhi bar council’s current chairman Rakesh Tiku wrote to at least three law firms trading as LLPs, warning them that their conversion had been “attracting serious attention of Bar Council of Delhi as well as the other State Bar Councils". “Prima facie it appears…that such a recourse is not permissible as it may amount to misconduct…and that you, being registered as an LLP under the LLP Act, without being enrolled as an advocate are engaged in the practice of law in violation of Section 29 and 33 of the Advocates Act, 1961," he wrote. While the bar council was not yet pursuing disciplinary proceedings against the law firms, he wrote that it reserved the right to “initiate appropriate action". Tiku requested responses from addressee law firms, asking for information and contracts governing the partnerships as well as details of any arrangements the firms had with foreign law firms. In response to the letter, Kaden Boriss Legal decided to mothball its LLP operations and rolled its entire business back into the normal partnership structure, which had continued running in parallel to the LLP. Hemant Batra, Kaden Boriss’ lead partner, said that unless he was looking at foreign investment, which was in any case prohibited in the legal sector, this did not make a huge difference in daily operations and he had been advised it was prudent to wait until the bar councils reached a final decision. 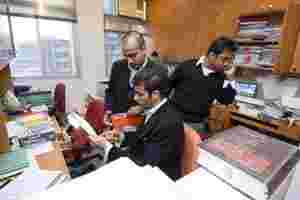 Within a week, on 2 November, elected Delhi bar council members Vijay Sondhi and Punit Mittal wrote a letter to Tiku, claiming that his notice did not have the “sanction and/or approval of the Bar Council of Delhi", was “illegal" and was “deemed to be withdrawn". “The Bar Council of Delhi and India should come up with guidelines. I think it was premature for the chairman to issue that protest," Sondhi said in an interview. “Whatever Mr Tiku has done, he has done in a personal capacity and has not been ratified." Tiku declined to comment when contacted. Trilegal, which registered its LLP name in 2009 but never converted, had approached the Bar Council of India (BCI) in early 2010 for confirmation. Trilegal partner Anand Prasad said, “Nothing has happened—we’ve not heard anything since Gopal Subramanium left." Subramanium, the former solicitor general, had been the ex-officio chairman of BCI until he resigned from his post in July 2011. Since then, the question of LLPs had been on the agenda at several BCI meetings, but was always postponed. “There is nothing on this issue before the Bar Council of India now," Subramanium’s BCI successor Ashok Parija confirmed. “There may be some confusion. Let the laws firms make a representation. We will consider it." Parija added that the issue was ultimately one to be discussed and agreed with M. Veerappa Moily’s MCA, and said an announcement would be made at “the appropriate time". Moily was not immediately available for comment. One lawyer in an LLP law firm was unimpressed with the pace of progress. “If the bar council is not interested in transparency of lawyers, I am the last person to insist on it," the lawyer said on condition of anonymity. “We are living in the Stone Age." Mint’s association with Legally India will bring you fortnightly insight and analysis of major developments in law, courts, firms and universities.